RALEIGH, North Carolina -- Did you participate in the Women's March in the nation's capital in January? Perhaps you were one of the ones who stayed closer to home and joined the 17,000 people who came together in Raleigh for a Sister Rally? Or maybe you were one of those who questioned the marchers and their messages. Tonight, you can participate in a Town Hall to have your voice heard. The News & Observer, with support from ABC11, is launching Community Voices, a series of forums on a variety of issues over the next year. The first question the series hopes to discuss: The Women's March - It Was Big, But Is It Over? The community conversations, similar to TED Talks, are designed to bring together panelists who can help media organizations inform their audiences, as well as learn from them. 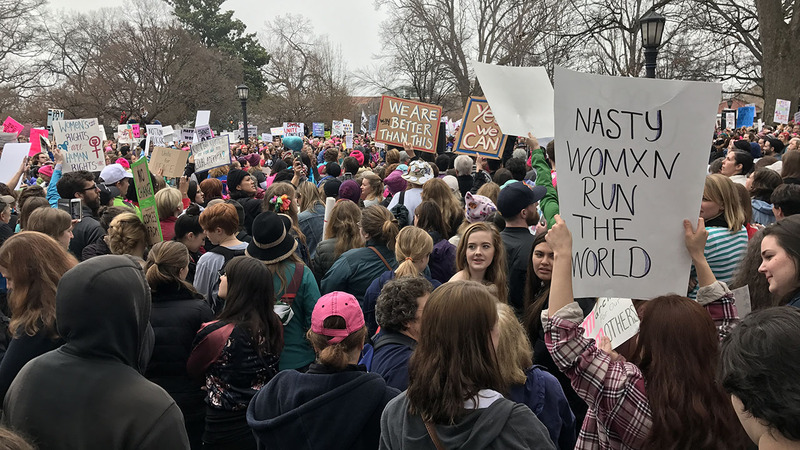 The discussion of themes related to the Women's March will be from 7 to 8:30 p.m. Wednesday at the James B. Hunt Jr. Library, 1070 Partners Way on N.C. State University's Centennial Campus. Another topic on the horizon is how North Carolina got Beer Here and the economic impact of microbrewing, as well as the challenges and growth opportunities ahead. On the June schedule is how others see North Carolina, in part, through the lens of HB2. "The forums are intended to increase The N&O's involvement with readers and the wider community and provide a platform for debate about issues that affect the Triangle and North Carolina," said Ned Barnett, editorial page editor. "Some who participate may find ways to continue the discussion or take action as a result." To sign up for the free events, go to this eventbrite page.